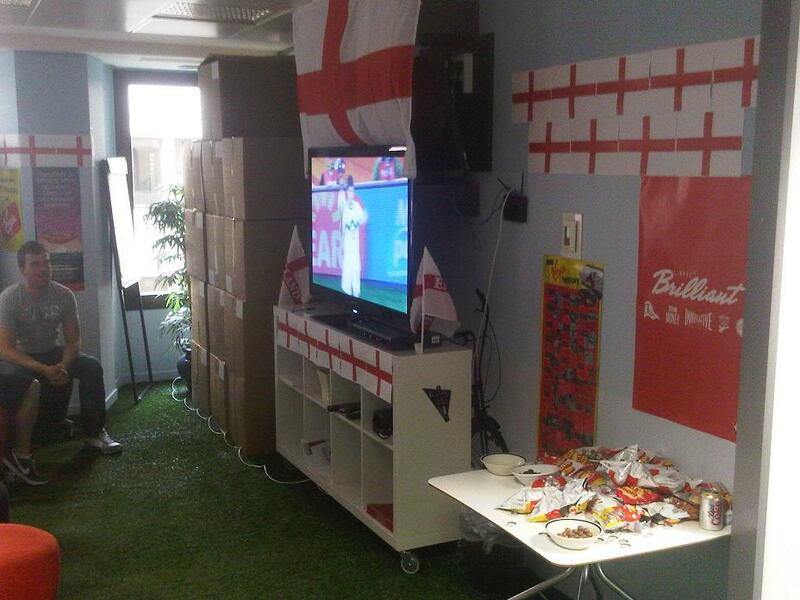 I noted yesterday that the BBC said they had 800,000 concurrent streams of people watching the England v Slovenia match on Tuesday, which I watched in our Covent Garden offices in London - and didn't Kevin in our facilities team do a cracking job of decorating the TV area for? : So I thought I'd find out from Tim in our networks team (who is a general all round transit, routing and peering guru) what proportion of those were our residential customers - and I got all kinds of interesting graphs in response. Note also the relative dip in the evening as the never ending tennis match on Tuesday night dragged people away from their broadband connections and in front of the TV as well as the evening's football match ... and no doubt a few people out celebrating! We believe that we had something in the region of 35,000 to 37,500 concurrent streams (and a 30% increase in traffic compared to the same period on a 'normal' Wednesday) watching the match at any one time which, given our market share, would suggest to me that the BBC had the majority of their streams coming from people watching the game from work connections rather than their home ISP broadband connections. Overall though I was happiest at the result on Thursday, when my native New Zealand team managed to finish the whole tournament unbeaten - unlike Spain, Germany, France and Italy ... and ahead of Italy in our group to top off a magnificent performance. Well done to them all! Very Interesting post and Metrics Alex.